Now that the Grand Circuit’s in motion, the three-year-old glamour boys and girls will be working on their stakes agenda. This week, the colt pacers battle for a berth in the Max Hempt Final at Pocono Downs and in Simpson Stakes at Vernon Downs. At Woodbine, colt pacers shoot for a big purse in the Diplomat Stakes and the femmes hook up in the Pricess Stakes. The colt trotters continue to knock heads in Simpson Stakes at Vernon—those divisions are covered in The Hambletonian Trail blog and on the Hambletonian Society website. Older trotters and pacers, respectively, are still pounding the surface, this week at the Meadowlands in the Arthur Cutler Memorial Final and the Graduate. Don’t go superstitious on your behavior this Friday the 13th because you need all of your proper senses to take you through round two of the National Harness Handicapping Challenge (NHHC. Two seats are up for grabs from this TwinSpires contest, featuring races at the Meadowlands and Woodbine. Click here for all the information on what and how to bet that night to put you in pace with your coast-to-coast competitors. May 27 is the final round to choose the pair of people going to the Meadowlands for the NHHC final. Follow any and all tweets we supply for Friday that night at my Twitter account. Free-for-all standardbreds take on the two-turn mile with a prep for the A.J. Cutler Memorial (trotters) and an elim for the Graduate (pacers) on Saturday, May 14. In the $200,000 Cutler Final, it is hard to find the clear-cut favorite, but drawing a conclusion, the betting public will be watching Slave Dream, Looking Hanover and Enough Talk. But last week, Hot Shot Blue Chip was wildly ignored; he went off at 65-1 and did really well from post 8. Now he gets the 4 hole, making him one to watch. Also be aware of Lucky Jim. He may go off at a higher price due to his breaking issues. But if he stays flat, he will be in the mix. In the $246,000 Graduate Final, the public’s eye will mainly be on Foiled Again and Won The West, mostly based on their championship campaigns last year. After last week’s elim, greatness shone on Bettor Sweet as he returned to the Big M and scored a triumphant victory in 1:50, making him the one to beat. On Saturday at Pocono Downs a field of 10 will go to the gate in the $50,000 elimination for next week’s Max Hempt Final for glamour-boy pacers. In the elim, the betting public will likely put thei bulk of the wagering cash on Dana’s Sharp Smart. He has only lost one race this year and already beat many nominees looked well upon for the Meadowlands Pace. But one that will most likely be ignored is Sharp West Hanover. He closed well in a Pennsylvania Sires Stakes event at Chester, regaining 7 lengths. That kind of closing will be a plus at Pocono, where the stretch is the undoing of many speedy types. 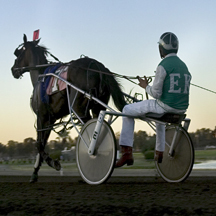 At Vernon Downs on May 14 a herd of sophomore colt-and-filly trotters make up divisions of the John Simpson Memorial. The bulk of these fields are eligible to the Hambletonian and the “Oaks.” Our exclusive coverage continues at The Hambletonian Trail blog and on the Hambletonian Society website. Saturday night, May 14, it’s time to take another crack at the no-takeout Pick 4 from Race 11 through Race 14. (4) Minettastuppence overcame a tough early trip to get the lead but held on by a neck. (7) Quick On My Feet was far back, leaving from post 8, and chewed up real estate wildly to win. (2) Awesome Deal N was stuck outside through the better part of the mile and still gained some ground at the finish in a powerful show of endurance at 16-1. Since all others considered contenders should be bet down and have to leave from the outside, this could be the magic single. (6) Stanza, at 29-1, flashed some speed that could be a flare for what is to come this week. (8) Satire has been successful against this bunch before and last week, sent off at 19-1, closed stoutly. (5) Bolero Twister just missed as a 5-2 overlay and must be the most respected of this bunch. If you want to use all of these, the 47/2/68/5 ticket cost $4 ($1 ticket).